Halloween-Thanksgiving-Hanukkah-Christmas-New-Year Buying Begins Most retailers are feeling optimistic as analysts forecast rising sales over this long shopping season. They are hoping Halloween will give them a good bounce into the peak spending time of the year. 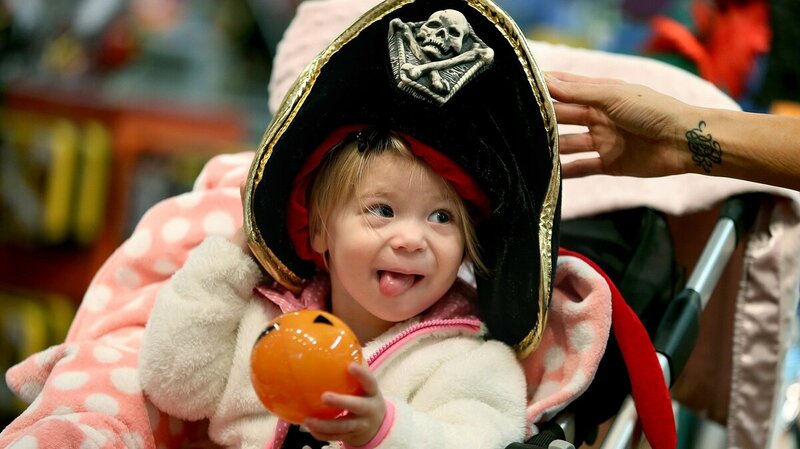 Candice Nelson fits her daughter Arya Kubesh with a Halloween hat at a store at Galleria Mall in Edina, Minn. Retailers are hoping Halloween will give them a good bounce into the peak spending time of the year. At any big-box store, you can find the annual holiday mash-up now on garish display: Halloween costumes are stacked next to the decorative turkey napkins and pre-lit Christmas trees. It's time to celebrate the Halloween-Thanksgiving-Hanukkah-Christmas-New-Year season! This year, most merchants are optimistic, predicting strong sales throughout the peak shopping period. Let's start with Halloween, with its sales of costumes, candy, cards and pumpkins. This year, the National Retail Federation predicts Halloween revenues will hit $7.4 billion, up from last year's $6.9 billion. Decorations will drive much of that spending, up to $2 billion, the trade group says. A generation ago, Dad might carve a pumpkin into a jack-o'-lantern, and that was that. Today, front yards are filled with electronic bubbling cauldrons, animated jumping spiders and talking witches. Another positive factor for retailers is that Oct. 31 falls on a Friday, which allows for more Halloween parties. And this is good news for party-throwers: Candy will cost, at most, just a few pennies more than last year. "Halloween candy price inflation has slowed tremendously over the past couple of years, thanks to depressed raw sugar and refined sugar beet prices," IHS Global Insight U.S. economist Chris Christopher said in his analysis of the holiday. Icing on your pumpkin cake: It will be cheaper to drive to those Halloween parties because gasoline prices have dropped dramatically in recent weeks to around $3 a gallon. Need one more reason for optimism? Congress is not in session. "Last year's federal government shutdown in the first half of October put a damper on consumer mood in the run-up to Halloween, and more importantly to the holiday retail sales season," Christopher said. And that's what merchants are really looking for: signs that a good Halloween will lead to an even stronger holiday season. The retail group is predicting a robust increase in spending in the year's final two months. The NRF's annual Consumer Spending Survey found the average person celebrating Christmas, Kwanzaa and/or Hanukkah will spend $804.42 this year, up nearly 5 percent over last year's actual $767.27. "Overall, consumers feel better about where they stand compared to a year ago, and as such could find themselves stretching their dollars to give their loved ones a holiday season to remember," Prosper's principal analyst Pam Goodfellow said in a statement. That prediction feels right to Antoine Kent, who was visiting New York City and shopping for a ninja costume for his godson. He believes the economy is strengthening enough to allow for more spending through the holidays. "It seems like it's getting a little better each year," Kent said. For the moment, he only needs to focus on Halloween because his 8-year-old godson was clear: "He said, 'Find me a ninja.' "
In case you are wondering: Yahoo says this year's most searched-for Halloween costumes include Teenage Mutant Ninja Turtles and Frozen princesses. By Christmas, most shopping lists will shift to electronics. Analysts are predicting the hottest gifts will include iPhones, digital fitness products and video games. NPR Business Desk intern Robert Szypko contributed to this report.